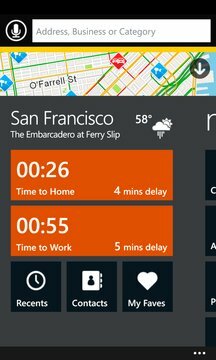 Join the community of millions of drivers using award-winning Scout, your personalized mapping and GPS navigation app for Windows Phone 8. On your daily commute and for discovering local weekend fun, you’ll always travel like a boss with Scout—packed with the most current maps, traffic-beating features, and voice-guided directions to nearby restaurants, cheap gas, and more! 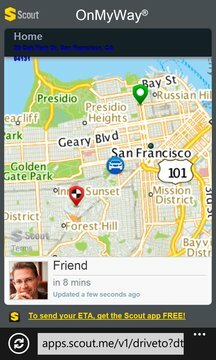 ✔ OnMyWay® ETA-sharing – No more “where are u?” texts! Scout lets others know when you’ll be there and lets them follow your real-time progress on a map. ✔ Your favorite spots on a map – See what places you’ve liked previously wherever you are. ✔ Visual enhancements – We’re always working to improve your experience, even with the small stuff. ✔ My Dashboard — This handy home screen is always updated with the most relevant local info for your journey. ✔ Multiple routes— Choose from up to three traffic-optimized routes that gets you to your destination. ✔ Step-by-Step Turn list — Easily follow the directions for your selected route with a visual list of turns. ✔ Local search — With millions of listings, find what you need wherever you are with the search box. ✔ Nearby Places — With just one tap, find nearby gas, restaurants and more, with details like phone number and reviews. ✔ My Places — Save your favorite and most frequented places. Navigate and beat traffic like a pro with the Scout Plus in-app purchase. ✔ Voice Turn-by-Turn Directions —Drive confidently with award-winning voice-guided, turn-by-turn directions with OnMyWay® ETA-sharing. ✔ Traffic Alerts —Know what to expect along your route with real-time traffic alerts and avoid jams with one-tap rerouting. ✔ Maps with red-light cameras and traffic flows — See nearby traffic flows and have a heads up on red-light cameras. ✔ Voice Commands — Speak, don’t type, to view a map or directions to a street address or saved place and navigate there hands free.